You can’t get any more Christmassy than snow and the delightful winter feels it brings. It’s bright, glorious, and all things lovely. It also brings back memories of childhood waiting for that magical moment of the first snowfall of the year. Bottle all these nostalgic feelings and channel them into your parade float as you deck it out with parade float snow — makeshift snow, that is. And we’ll show you how in three easy ways. In our previous article — Five Must-Haves for a Great Christmas Parade Float — we have briefly outlined the beautiful effects of parade float snow floral sheeting and how you can use it to decorate your trailer bed. Now we can go into more details. Snow floral sheeting is a versatile float décor. For the Iridescent Snow Floral Sheeting, each easy-to-use roll features iridescent flakes that sparkle and shine under the light, making it truly breathtaking. To start, measure the breadth of your trailer bed/flooring; order more than enough rolls to cover the whole length of the trailer, plus, extras for other areas. 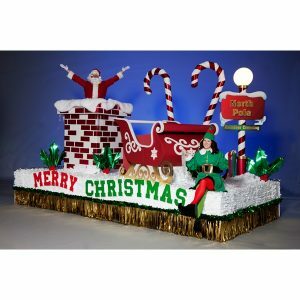 Need winter and holiday parade float ideas? The holidays are upon us. In this article, we will give you some parade float ideas and concepts — ranging from the fun, colorful and popular to the classic or one-of-a-kind — and how you can make your parade float stand out this season. This is a staple among holiday parade floats and it never fails to amaze. In bright royal blue and white, this beautiful theme still has its fans. Use silver foil and glitter to add a bedazzling effect. Build gorgeous scenery using snowflake tree kits. 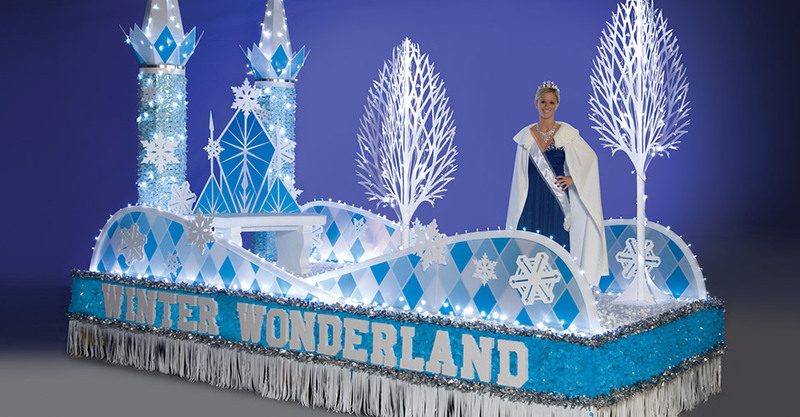 When pressed for time, you can readily use a fully decorated float kit like our Winter Wonderland Complete Parade Float Theme and you’re good to go (with only minimal decorations or lights to be added). As classically appealing as ever, Christmas trees and evergreens never fail to put us all in good spirits. They bring a sense of hope and cheer that this holiday just might be the best yet. When choosing trees for Christmas parade floats, consider the size of the trailer and the possible weight it can hold. 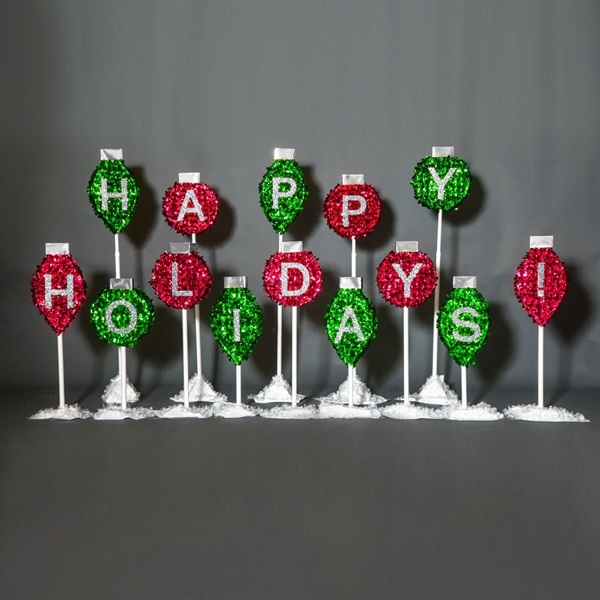 If you can’t find a real tree that will fit with the rest of your float decors, you might want to opt for plastic or full-color cardboard standup versions that are just as delightful; they weigh less, too, so there would be less strain for the trailer. If you are going for a non-traditional holiday parade float concept, then our set of Lit Trees will work perfectly for you. They come with floral sheeting in your choice of metallic shades that will certainly catch the eye of the audience and enhance the overall look of your design. Should I Have a Parade Float Mascot? Now that your parade float is just about ready (please read our awesome guides and tips on how to build parade floats), now is the perfect time to pick what other accessories you can add to make your float stand out. A Parade Float Mascot can be a great addition! One popular method is to use mascots. But what are mascots exactly? And how can they help you gain and retain the audience’s attention? -Mascots are branding elements used for merchandising, advertising or promoting a company or organization. They become that company’s representative, symbol or communication link to the public. -In the past, mascots are thought to be bringers of good luck, the idea of which can still apply now. Mascots that are able to resonate with the public raises the public’s awareness of the company, directly or indirectly, affecting the company’s popularity, rise in sales, etc. -They function as ambassadors of goodwill to spectators and audience. This is especially true during games or exhibitions where people can have their photos taken with the team mascot. A friendly mascot somehow paints a picture of the friendliness and approachability of the team or company it represents. Posted in Parade Float Mascots	| Tagged float mascot, mascot, mascots, parade float mascot, parade float mascots, should I have a mascot? Discuss with your team the theme or design of the float including the color motif and materials you’re going to use. Here are the important questions to consider before building your float. How big is the float? How elaborate is its design? Parade Float Image Contest – Win $100! Upload an image (or 2!) of your parade floats and you could win $100 in supplies. 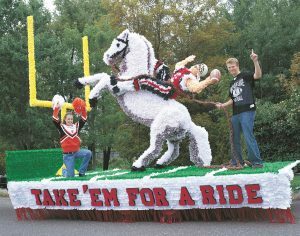 Show us your parade float! Use our supplies for a chance to win merchandising credit. *Contest runs July 1, 2017 to August 1, 2017. You may submit an entry once per day. Winner will be announced on our Facebook page and contacted through email. If you’re constructing your own custom parade float–building with wood or chicken wire–you’ll need something to cover up unsightly pieces of construction. With this simple guide, you can create paper parade float flowers in any color or pattern you want. Get a group of friends together, get some supplies, and get those flowers blooming! You can make your next float look just as good as this one!